Yesterday, my friend Enrique Del Risco spelled out his reasons why people should not try to convince him to join the blue mass or the red mass. I wrote him a note telling him that I subscribed them, and I also thanked him since he had saved me from having to write something similar. There is little to add to what Del Risco so eloquently said [in Spanish]. Nevertheless, I told him that I would try to insert some comments in the gaps he leaves between paragraphs of irrefutable arguments. Here are my notes. Not only do I not want people to try to convince me. I do not want to convince anyone. We are all grown ups. When the next occupant of the White House is announced, my candidate will not have won or lost. The reason is simple: I don’t have a candidate. I am going to vote for one of the two, obviously, but —watch out— whomever wins my vote is not my candidate. I do not care about the arguments that made my friends, neighbors, colleagues, relatives and acquaintances vote for the Democrat or the Republican. Voting is their right. Of the reasons that made me decide for one of the two, I give you the most generic (that, nevertheless, is not trivial): I like the other candidate less. It does not matter who wins the presidential election. When I turned my back to the ballot box after having voted, I had already won. Participating in the democratic process is, on its own, my victory. (If you think that I am exaggerating, please look at my happy face). Why does this mundane exercise make me so happy? Because I grew up in land of one party rule. There are no elections in Cuba, and even my dog knows that. But in 1999, I had my own election. And I chose to escape. On that occasion, I voted with my feet. Do not ask me for whom I voted today. My candidate choice is between me and the ballot box. This entry was posted in Cuba, USA and tagged Elections 2012, United States. Bookmark the permalink. Or maybe the reason is that you still carry fear in your heart. 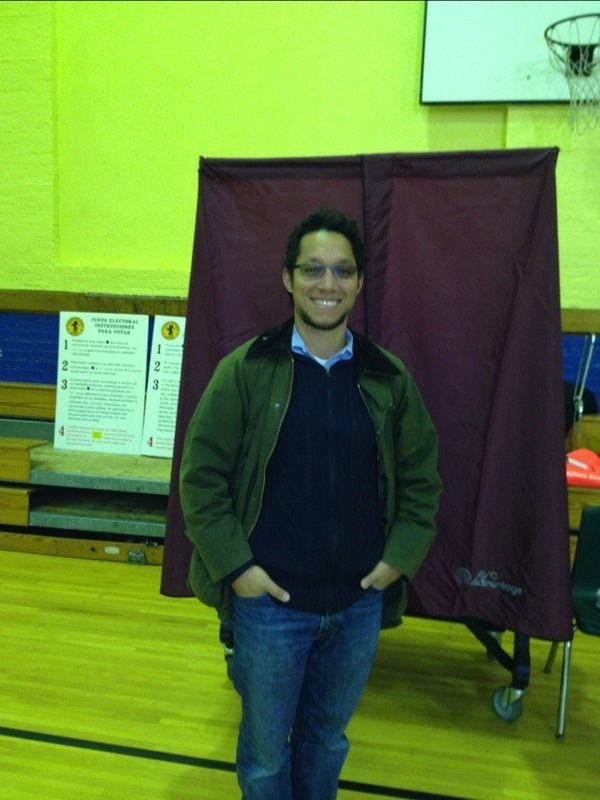 Between you and I, and the ballot box, if it so pleases you: I proudly voted for Mitt Romney. Between you and I, I don’t care. Mixing Memory and Desire is a blog about Cuba, literature and other tropical diseases. It borrows its title from T. S. Eliot’s The Waste Land. My name is Alexis Romay, and I approve this message. Follow this blog. You know you want to!